All good things must come to an end. The house is quiet again. No more Noah yelling 'Grandma, Grandad' as he bounces in the door from daycare each day. Even though it was really Grandma & Grandad's holiday, we feel that we've been on holiday with them this whole time, the atmosphere at home has been like we're on a magical summer tour for the past six weeks even though we've actually been working most of the time. When Grandma & Grandad arrived back from Nana & Poppa's 10 days ago, we met them off the plane at the airport. Noah was SO excited to see them come through the gates, yelling 'That's my Grandad & Grandma', much to the amusement of all those in the waiting area, and I think Grandma & Grandad were tickled pink to receive such a welcoming reception. We drove around the corner to Lyall Bay and enjoyed an impromptu fish and chips by the sea. As it was 6.30pm and peak travel time, Noah was kept entertained with several 737's taking off in the space of just a few minutes. Friday night we enjoyed catching up with our friends Tracey, Dayne and kids Cameron & Mikayla at home, where we all enjoyed Grandma's homemade lasagne for dinner. Saturday, we had a quiet morning around home, then travelled out to Plimmerton to Magnus' 2nd birthday party at Marissa & Keryn's. 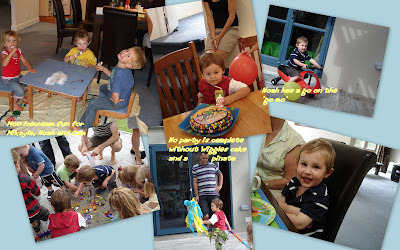 It was a lovely party, complete with pinata full of goodies for the kids, and some yummy party fare. Daddy & Grandad hit the shops in Porirua whilst Noah, Grandma and I attended the party - not that those two ever really need an excuse for shopping! 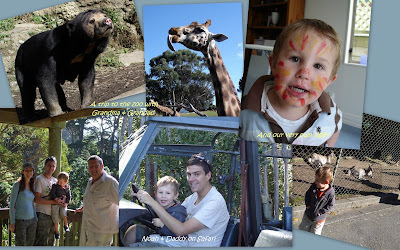 Sunday morning, and we were up bright and early to avoid the crowds heading for the Newtown fair, and wiled away a lovely couple of hours at the zoo. 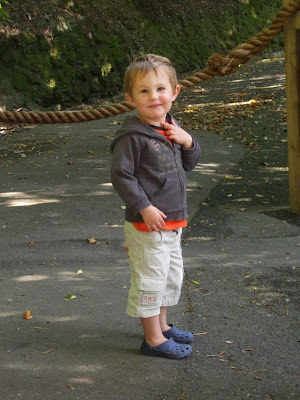 Noah was in his element, racing ahead telling Grandma & Grandad which animals came next. Then we enjoyed another Kiwi traditon with Grandma & Grandad for lunch - homemade corn fritters, sitting outside on our patio in the sunshine - divine. Noah, Daddy & Grandma headed off for a swim with some of his daycare friends whilst I enjoyed a 1.5 hr bike ride around Karori and then sat down to figure out the logistics of my latest creative idea - some artwork for above our bed inspired by a picture I saw in the Air NZ flight magazine on the 'flight that shall remain nameless' home - but more on that later once I've got something to show for my efforts! Mark and I enjoyed a night out at Becky & Jonny's for dinner on Sunday night whilst Grandma & Grandad babysat. This week has been pretty full of events. Wednesday night, Mark and I enjoyed a meal out at the General Practitioner to farewell Mark's friend and APX colleague Gareth and his partner, Lisa who are moving to Melbourne. Thursday night was a fish n chip night at daycare to farewell 3 teachers who are leaving. Noah's gorgeous teacher, Robbie has just been made Centre Manager and it was her job to farewell her team members - quite an emotional undertaking. She did an awesome job of what was a rather sad and poignant occasion, and which was her first big event as centre manager. Grandma & Grandad really enjoyed the opportunity to see Noah in his daycare environment amongst all his lovely friends, their parents and his wonderful teachers. The fish n chips from the Wellington Trawling Market really lived up to expectation too! Poor Grandad had a fall in the week and is nursing a suspected cracked rib, poor thing! We hope that it doesn't hinder their travels back home via Perth and South Africa too much. Luckily, he has been able to take his mind off the pain somewhat with all his Trade Me bargain hunting. For someone who has never really used the computer or Internet, he is fast getting up to speed with buying bargains online. His best buy so far was a beautiful amethyst bought tonight for $103 which had a buy-now of $380. We'll be very interested to see what that goes for in Inglenook (their little antique shop back home in England). Well without further ado, its high time we explained the 'hello' part of the blog title. 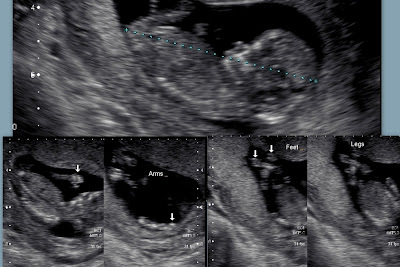 Friday morning was a very special morning for us in our household as we had an important date to keep, our 12-week ultrasound scan to say our first 'HELLO!' to No. 2! It was made all the more special for us that both Noah and Grandma could attend the scan too. All is well, and we will be excited to welcome him or her into the world sometime around the 24th September this year! Noah is very much wanting to be part of the action, and is convinced he also has a baby in his tummy too, even though we have told him that only mummies have babies, he still replies 'And me!' Bless him. Friday night the four of us went out for a last lovely evening meal at Tinakori Bistro to celebrate the (near) end of our fantastic six weeks together while Jackie babysat. Saturday afternoon we took a trip up to the local park which we had completely to ourselves, something we can never quite believe! Then we enjoyed a beautiful lamb roast together tonight, our first in many months after all the summer BBQs. The highlight and fitting end to today was our impromptu dance (Grandma & Grandad included) to Zorba the Greek. It's a traditional Greek dance which starts off very slowly and gradually gets faster and faster. Here's a link to the song on Youtube 'Zorba the Greek'. It would have looked hilarious if you'd been a fly on the wall or anyone looking in the window for that matter seeing us all kicking our heels up and dancing around the lounge. I have a feeling it might become Noah's new favourite song! But what an entertaining and fitting end to a wonderful last day together. This afternoon after dropping Grandma & Grandad at the airport, we came home and decided to see if we could see their plane take off out our bedroom window (as we often do see all the planes). Well we learnt something new today, it turns out that we can actually see planes on the runway and waiting at the terminal from our window!We actually saw their plane move back away from the airbridge (the red Qantas tail was a great help!) and then saw it taking off through a gap in the trees, we watched it go up, up and away, and because of the beautiful clear windless skies we could see it for many minutes as it climbed higher and higher, before it turned and flew over the hills of Brooklyn and past the wind turbine and out of sight. And as I write, Grandma & Grandad are now winging their way home across the seas via Perth and South Africa before arriving in England in 2 weeks time. For us, we will treasure and hold onto the many, many wonderful memories we have created over the past six weeks together. We couldn't have asked for a more special time. Noah has simply blossomed in their company, we have so enjoyed being an extended family and for a few glorious weeks, it has been a magical interlude, imagining how different life would be if we really lived so close that we could see each other this much all the time. As sad and heartwrenching as it is to see them go again, we are so very blessed to have even had them here at all that we will linger in these lavish memories for a long time to come. Wow - this is such a beautiful post and you guys are sooo busy! I'm so impressed Meghan that you've been managing to do all this whilst being in the early, tiring stages of pregnancy - inspirational! I loved reading about the special times you've shared with your family - I know so well that sadness of parting; but also share that great joy of being so fortunate to have such a loving family - and when we're together every moment really is one to treasure till the next time. I hope they got back to England safely and had an amazing time in Perth and South Africa (despite the suspected broken rib!) - and hope the Amethyst fetches a good price too!